Secure storage is playing an increasingly important role in today's fast moving market, especially for those moving abroad or returning to the UK. Alexander James International Removals offers secure, clean & economical storage and provides a complete collection, storage and delivery service. Our storage facility is located in Gosport in Hampshire which is just 10 miles from the Portsmouth Continental Ferry Port - putting us in a perfect location for all your requirements. So, when you're planning your move abroad and need either time to find the perfect place to buy or you just need to store your furniture while restoring a beautiful French house, consider storage with Alexander James International Removals. Storage is ideal for people moving between properties, moving on temporary contracts or those who simply require extra space. We offer short and long term storage at very competitive prices. All storage is offered in 250 cubic ft. crates which measure 7'x 5'x 7'. We also offer 2 weeks free storage in the UK for all moves to and from France. Crate storage is fast, safe and keeps handling to a minimum - goods will only be handled twice: into a crate at your door; out of the crate at your new home. The crate is not opened and your goods will not be handled again at the warehouse no matter how long you decide to store your goods with us. We understand that the things you are storing are precious to you. We treat everything with the highest level of care and all our storage facilities are fully insured. You can bring your items into our storage facility yourself. If you advise us when you would like to bring your items into store then we will make sure we have empty crates ready for you to load. Crates will then be closed and stored away until you are ready to collect your goods. 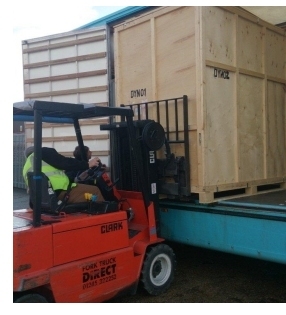 Alexander James International Removals can supply you with a single crate or multiple crates. Please see the general guideline below to assess how many crates you need.